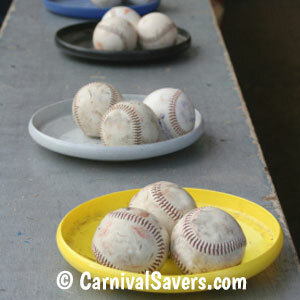 Carnival Game Idea: Baseball Throw! Rubber Baseballs Are Much Safer for this Game. Can also be played at the end of a long table. 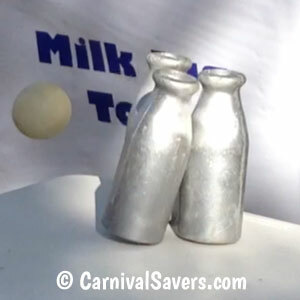 Before the carnival, setup each the 1 pound milk bottles into a pyramid as shown in the game photo. Also, make sure you locate this game in front of a baseball stop or another way to stop the rubber baseballs from bouncing and rolling all over the carnival. Also, test the baseball throw for difficulty and place “stand behind” lines or hula hoops for different age children using sidewalk chalk, tape or hula hoops. Children are given three rubber baseballs to throw per game. Depending on the setup of the stand, they win prizes based upon how many Milk Bottles they knock down. You can make the game more difficult by requiring players to knock the entire group of Milk Bottles off the stand or just require that all Milk Bottles be knocked over to win. Like all other school and church kids’ carnival games, everyone at least wins a consolation prize. Older children, teens and adults especially love this game of skill. Choose some prizes that will keep them coming back to try to win! Note: This is a traditional carnival game BEST PLAYED OUTDOORS!! Why? When the aluminum bottles fall and hit each other, they make a loud clashing noise especially when they fall on cement! Falling on the grass is a better solution when played outside. When planning this game for a large school or church carnival, two games can be played at the same time as shown in our top image. Note: Your volunteers will spend some time picking up the balls that hit the ground and roll around. Be sure to have at least 6 rubber baseballs for each game so the game does not stop while the volunteers are collecting the balls. The easiest way to set up the game is to use your school or church baseball backstop with small stools or tables for the Milk Bottles as shown. Keep in mind that you want to group carnival games in the same proximity. Families may not walk far to play just one game! 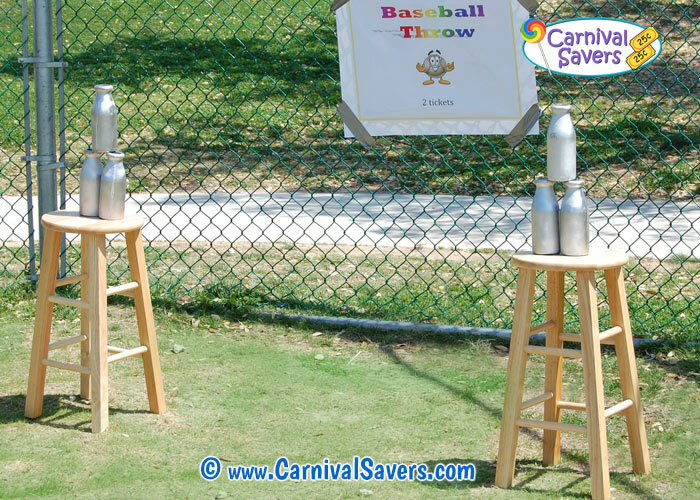 HIT a HOME RUN with these FUN CARNIVAL PRIZES and SUPPLIES for the BASEBALL TOSS!